If the Danish women’s national football team is affected by the very public conflict with the national football association DBU, they certainly didn’t show it on the pitch. 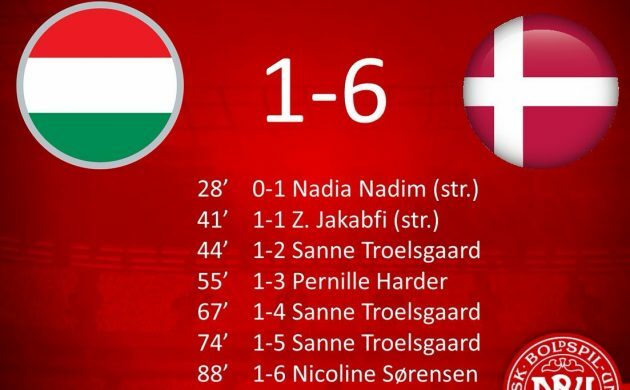 In a game that was close to being cancelled due to the conflict, Denmark thrashed Hungary 6-1 in Györ in their first 2019 World Cup Qualifier last night. Sanne Troelsgaard led the way with a hat-trick, while Nadia Nadim, Pernille Harder and Nicoline Sørensen also found the back of the net. The win puts the Danes top of Group 4 on goal difference ahead of rivals Sweden, who they take on next month in Gothenburg. The other teams in the group are Croatia and Ukraine. The Danish cycling talent Mikkel Bjerg absolutely destroyed the competition at the Under-23 time trial World Cup in Bergen, Norway, held over the weekend. Despite being just 18, Bjerg rode the 37.2 kilometres in just 47 minutes and six seconds, over a minute better than US runner-up Brandon McNulty. Reigning Euro champion and fellow Dane, Mikkel Asgreen, came in seventh. The Danish men’s badminton doubles team of Mathias Boe and Carsten Mogensen won the Korea Open by beating second-seeded Marcus Gideon and Kevin Sukamuljo of Indonesia in three sets, 21-19, 19-21, 21-15. The top-seeded Danes also won in Korea in 2009 and 2014 and now have 16 Super Series triumphs to their name. In related news, Danish badminton legend Morten Frost has stepped down as the technical head of the Malaysian badminton association after two years in the position. After a sluggish start to his career in Rosenborg, Danish striker Nicklas Bendtner has begun scoring goals in earnest and now has 12 league goals to his name – good enough to be ranked fourth in the Norwegian Eliteserien. He’s also been a commercial success for the Norwegian stalwarts, who have cashed in on Bendtner’s rising popularity. The clubs merchandise shop has sold Bendtner jerseys to the tune of 1.4 million kroner so far – so a far cry from his woeful days at Juventus, which claimed never to have sold a single Bendtner top. The sports confederation of Denmark, DIF, has announced that it has assumed responsibility for Danish participation in the Paralympics and has put the sport on a par with traditional sports. Until now, DIF had only organised the Danish Olympic participation, while Parasport Danmark had controlled the Danish participation at Paralympics. Parasport Danmark’s head Niels Christiansen was “very pleased” that parasport was now on equal terms with the traditional Olympic Games.